Building your own canopy/camper is easier than you think. You just have to have some time,basic hand tools and skills, and some money. 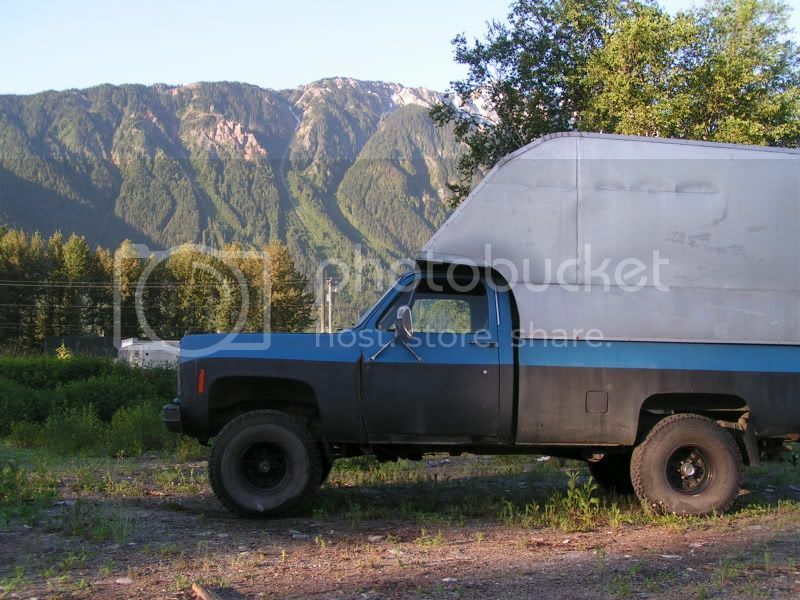 I looked at used campers for my truck and they were $3000 plus, and then i would have to modify them to suit my needs. I came to the conclusion that it was easier and better to build my own. First you have to find out what you need. I am a carpenter that usually works alone, so I needed something that would be easy to load heavy tools and lumber. I also needed a sleeper so that I had a fast place to catch a nap after work. 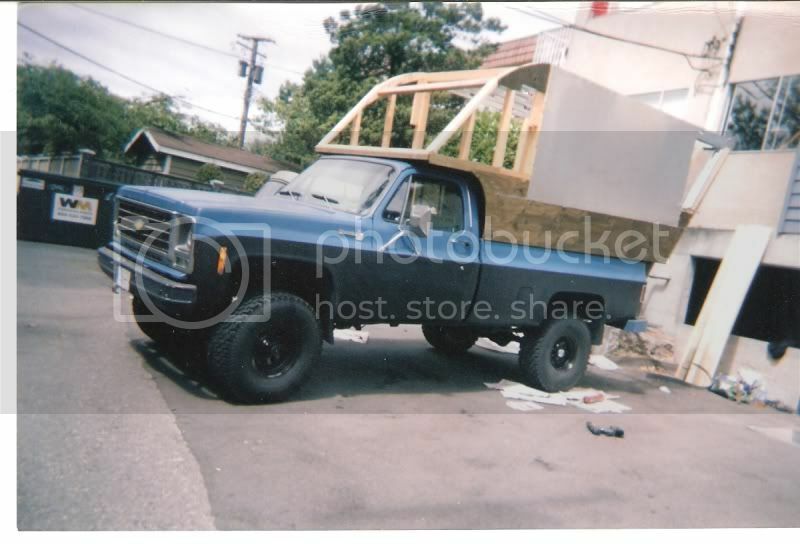 Thus i decided a full standing height inside with an area for a bed over the cab of the truck would be perfect. Here you can see the box I made of 3/4pressure treated plywood with 45degree gussets screwed and glued into the bottom of the box and under the side of the shelf that goes over the pickup bed. There is a hole cut out to access the cab through the rear slider window. I assembled the box on top of the pick-up bed so that I had easy access to glue and screw all joints together. After it was easy to drop the box into the bed with 2 men. Yes, pressure treated is real HEAVY! This shows the view from the back. The big opening is for a ramp that is hinged on the bottom and folds down much like the drawbridge of an old castle. Inside you can see how i just built a wall on top of were the 3/4 treated plywood stops, that is flush with the outside edge of the ply. The cross members supporting the horizontal steel studs are a 4 pack of 2by4s. This gives you an idea of the vertical and horizontal steels studs and 2by4s. There is a 3/4 ply gusset at the upper part of the rounded top at the front which is flush at the outer edge with the vertical studs so that the whole side and top is ready for the outer skin. Here you can see the the addition of the outside aluminum sheeting. It is super thin and light weight and requires no maintenance. The aluminum sheeting is glued on. Thanks for posting up, I have wanted the back story on your camper since seeing pics of it in a few other threads. Like the aerodynamic shape in front, the way it follows the angle of the front windshield. And the big, super big panoramic type window in front. If you spend much time in it and start to get migrane headaches, shortness of breath, impotence, a tomato growing on your neck, whatever... I have heard that the pressure treated ply woods off gas some noxious and very unhealthy fumes. Keep it it mind if you start feeling funky. 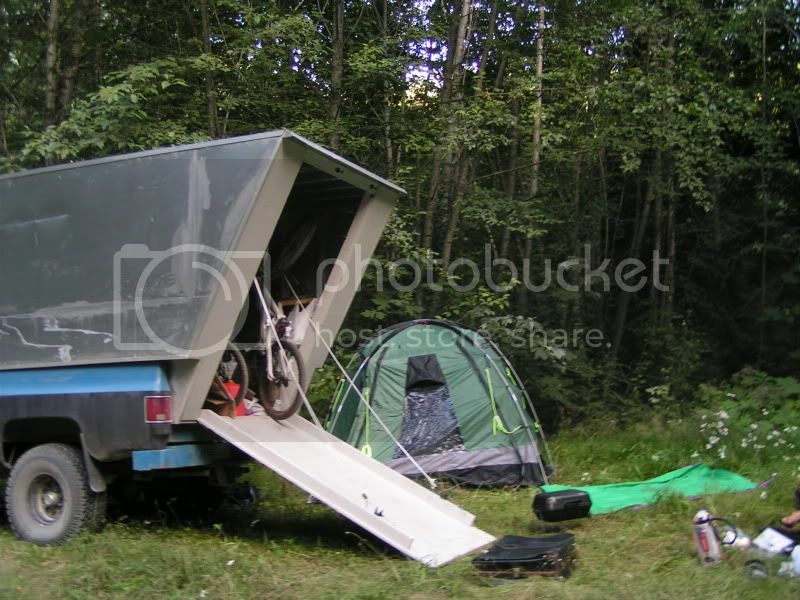 Like the angle to the back of the camper and the Chevy/GMC too. If you have any more pics of the finished camper, would love to see them. If you have done any interior finish work, although you stated it's a work camper as well. Might be a shell. Exterior shots are good too though. Thanks for the heads up about pressure treated wood Terrainist. In retrospect I think it would have been better to use ordinary plywood and then paint it or cover it with some thin aluminum. It does seem that now after 5 years the treated would is trying to eat its way through the thin aluminum covering. The big window in the sleeping area is a sheet of plexiglas. The inside is insulated and then covered with moisture resistant drywall. I think that if I were to build another one i would use a light wood veneer but I was thinking fire resistant when i built it. This show just how easy it is to unload and load your gear. If I made the ramp stronger I could probably ride a motorbike up the ramp. Thanks for the photos. Something about the last one that is really cool, maybe it's the angles and the uniqueness of the woman. Nice photo. Thanks Terrainist. I too enjoy the unique woman, and I would have to agree with you that pics with nice angles are interesting. 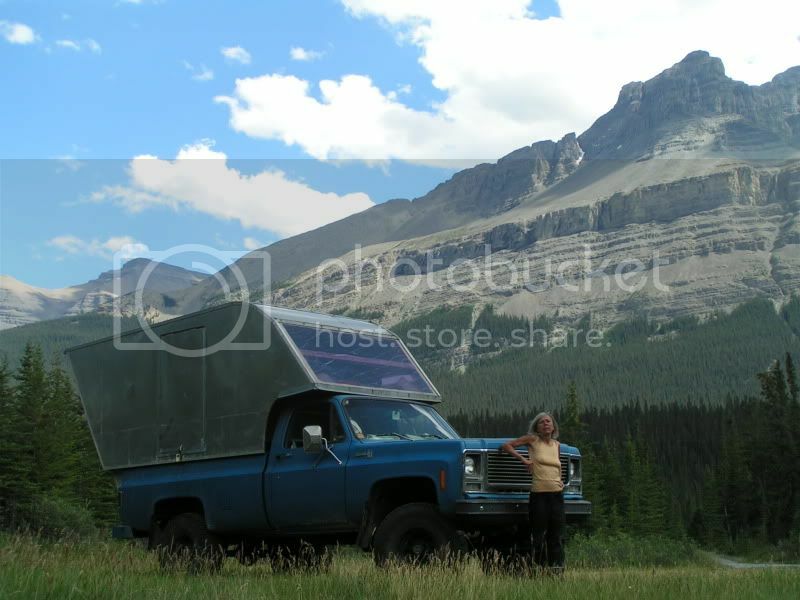 Here you can see the Canadian Rockies again with some nice angles. Turbo, I have really know idea how heavy the canopy is. 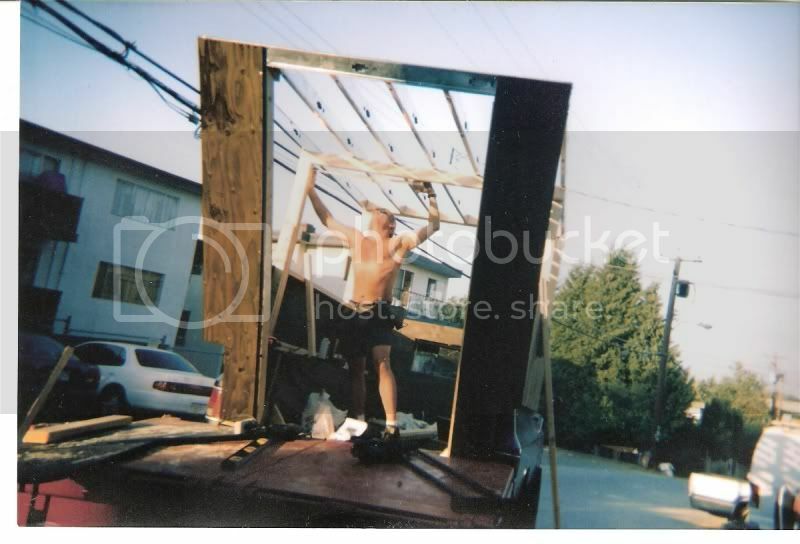 But take 4 sheets of pressure treated 3/4 ply, 20 2by4s, 20 steel studs, 3 sheets of drywall, thin aluminum for the sides and thicker 3/16 aluminum for the top, and some insulation and then you get the idea. Cant be too heavy. You can see from the second pic in the first post that the springs hardly sag at all. 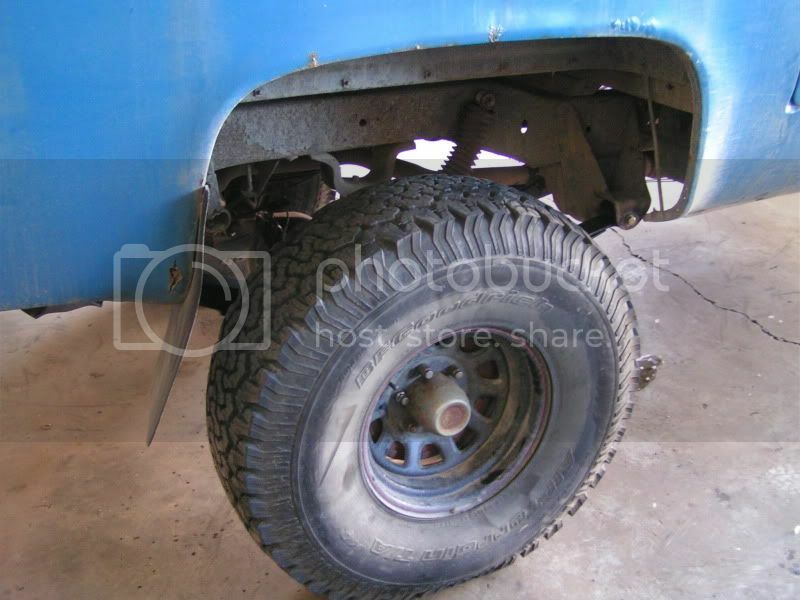 Although they certainly are sagging in the last pic in the first post due to heavy cargo weight. Since then they have been replaced. The aluminum trim I use for trimming out houses has a caution on the box to not put it over treated wood. Anyone try Nyloboard.com yet? Its can be used instead of plywood and is made from recycled carpets with no harmful off gassing. I don't mean to highjack this thread, but since we are on the subject. My local green building supply store, Artemis Environmental, is selling Polyboard. I haven't used it yet, but the compny claims their product has the same structural integrety as plywood, comes in same standard dimenions, will hold a screw just as well, does not root, is not bonded with any formeldhyde-urea glue like conventional plywood and is made from recycled carpet. 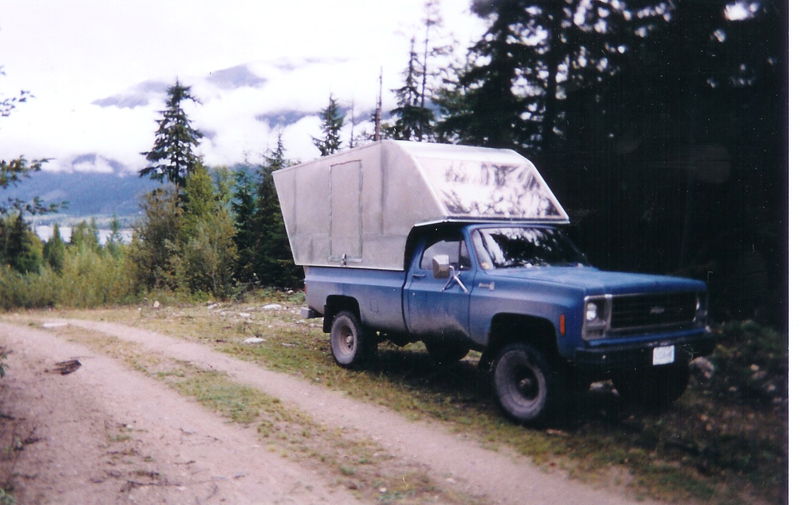 I plan on making a non-cabover Alaskan-like camper using this product, rigid foam in S.I.P. panel construction. Have you had any problems with the cab-over section hitting the roof of the truck when you travel over very uneven terrain? 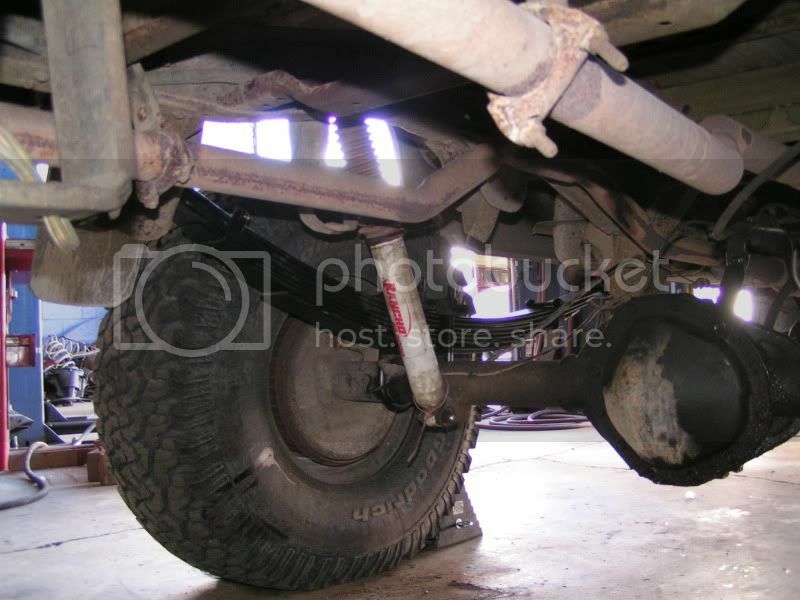 Most trucks have a frame that twists a couple of inches when the axles are crossed up.